Hello! I'm a Diplodocus. Just think of me as a giant! I use my long neck to reach the tops of tall trees. I clamp my jaw on a long branch, throw my head back, and use my comb like teeth to rake the leaves into my mouth. How yummy! I am also very proud of my long tail! 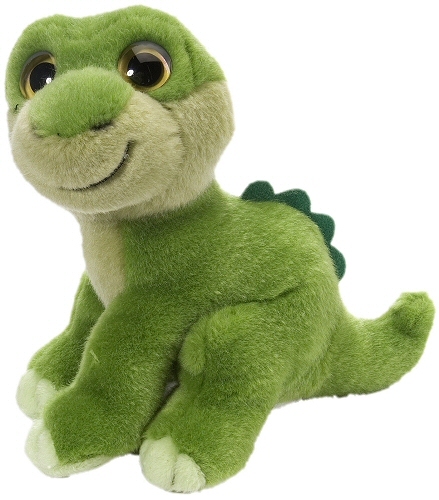 A portion of the proceeds from the sale of this Wild Watchers Diplodocus dinosaur stuffed animal help support foundations for disadvantaged children and abandoned animals. This adorable Wild Watchers stuffed Triceratops dinosaur has soft turquoise blue fur, gray toes and horns, and loving eyes in a sweet face. This adorable Wild Watchers stuffed T-Rex dinosaur has soft tan fur, rust and gray accents, fun felt teeth, and loving eyes in a sweet face. Stuffed stegosaurus dinosaur Stan has soft blue fur, light blue accents, and big sleepy yellow eyes. Bruno Brontosaurus stuffed animal has awesome oversized feet with gray toes and cuddly soft dark green and lime green fur. Create a fun jurassic themed room with this adorable Brontosaurus Dinosaur fabric wall art. This adorable Pterodactyl Dinosaur fabric wall art is a wonderful addition to any prehistoric or jurassic themed room.